In ongoing work with the Organisation for Economic Co-operation and Development (OECD), IFPRI released a new publication in EuroChoices  on August 16th aimed at reaching European policy makers. This work built off of last year’ s collaboration with OECD, which culminated in an 2014 OECD report on Climate Change Adaptation . The new publication in EuroChoices is coauthored by Ada Ignaciuk of the OECD, as well as Daniel Mason-D’Croz and Shahnila Islam of IFPRI. 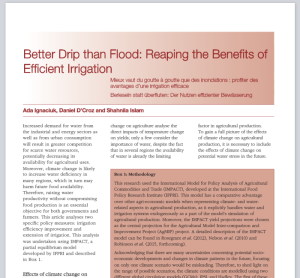 It extended the irrigation expansion and efficiency scenarios from the first study to non-OECD member countries, and focused the analysis of water scarcity and climate change on agriculture in Europe. This analysis highlighted the challenges confronting Southern Europe, which already experiences water stress and is threatened by increasing water shortages in alternative futures with climate change. The following figure taken from the article illustrates this water challenge, with Southern Europe and the Mediterranean Basin on the whole expected to see declining precipitation. To learn more about this study you can read the whole article at: http://onlinelibrary.wiley.com/doi/10.1111/1746-692X.12088/full. For more information about this collaborative work please read the CCAFS 2014 annual report highlighting the work. The full OECD report can also be access freely at: http://www.oecd-ilibrary.org/agriculture-and-food/modelling-adaptation-to-climate-change-in-agriculture_5jxrclljnbxq-en.